Sam Small has directed and edited national television commercials for Prudential Financial, Prudential Real Estate, Prudential Securities, Forgotten Women Stores, Viacom New Media and most recently Pro Support Systems… Sam's commercials have aired during two Super Bowls. National Spots for Prudential and Others; Sam Small: Director, Editor, Writer, Producer from samsmall on Vimeo. 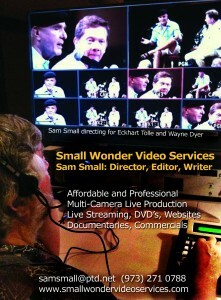 Sam Small: Producer, Director, Editor, Writer – National Spots for Prudential, Testimonial Style from samsmall on Vimeo.